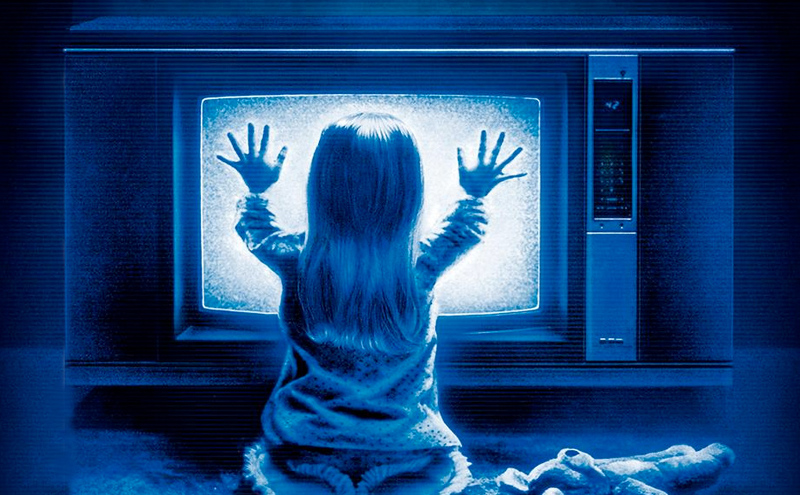 Once again, it’s a brand new episode of The Flickcast. But don’t worry, still not counting them to make sure you know we’re awesome and can deliver a new episode every week. Well, maybe a little bit because, well, we are awesome. On this week’s show, Chris and Joe talk about a whole bunch of stuff including the return of The Walking Dead, the new Poltergeist trailer, Game of Thrones Season 5, the upcoming Daredevil series from Netflix, the New New 52 and what’s going on with DC comics and a whole lot more, more more. Yep, it’s another long episode, but it’s chock full of good stuff. We hope you enjoy. Picks this week include Chris’ pick of the new Star Wars comic from Marvel and Joe’s pick of the new TV series Backstrom, starring Rain Wilson. You may be thinking “Oh, look; another crossover where the good guys fight, figure it out and save the day.” I wouldn’t blame you. I had anticipated the same when I sat down to read this 2003 one-shot from DC Comics and Wildstorm Productions. Boy, was I wrong as this was definitely not your cookie-cutter team-up tale. Far from it. 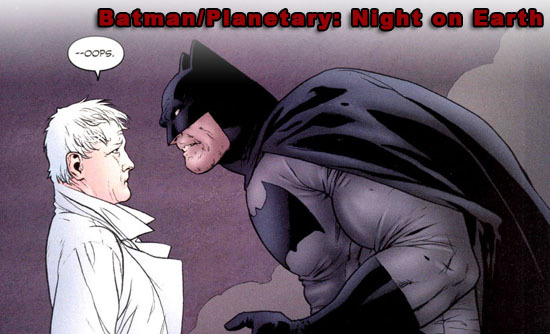 While almost anyone reading comics has read Batman (or, at the very least, is familiar with the Caped Crusader), the same can’t be said for Planetary. With that, I can confidently state that my lack of exposure to the Planetary series and its characters didn’t hamper my reading experience at all. I’d actually argue that this is primarily a Batman-centric story; even though various members of Planetary get more “screen time” than Bats himself. Which brings me to the creators. Warren Ellis is, well, Warren Ellis. If you don’t know what that means, you haven’t read much of his work. But if you have? You’re nodding along with me right now. Indefinable, he almost always seems to approach a story from a completely different angle than most of us can even conceive, and that’s part of what makes him a fan favorite. His handling of Batman here is both exciting and (seemingly) an open love letter to the character. There’s barely a beginning or end to this original graphic novel, and frankly, it doesn’t need it. Here’s another preview of the Astonishing X-Men motion comic from our pals at Marvel. This time around its Episode 4, written by Joss Whedon with art by John Cassaday. Here’s the info directly from Marvel. Marvel is proud to unveil your first look at episode 4 of the Astonishing X-Men Motion Comic! Based on the acclaimed story by superstars Joss Whedon (Buffy The Vampire Slayer) and John Cassaday (Captain America), the X-Men are faced with a mysterious new villain and a possible cure for the mutant gene! Now Cyclops, Wolverine and all your favorite mutants must face the greatest threats of their lives and, before it’s all done, experience one of the most jaw-dropping moments in Marvel history! Previously, we had taken you behind the scenes to see how these motion comics are made with some of the production team. This time around we’ve got another look behind the scenes with a different facet of the production. This one, hosted by David Goldberg of Edge Studio, give some insight into how the dialog and sound effects are designed and recorded. It also shows you a few of the voice actors hard at work giving life to their characters. Get a behind the scenes look at the chart-topping Astonishing X-Men Motion Comic with this all new video. Based on the acclaimed story by superstars Joss Whedon (Buffy The Vampire Slayer) and John Cassaday (Captain America), the X-Men are faced with a mysterious new villain and a possible cure for the mutant gene. Now Cyclops, Wolverine and all your favorite mutants must face the greatest threats of their lives and, before it’s all done, experience one of the most jaw-dropping moments in Marvel history. Be sure and check out the video after the jump, especially if you’re a fan of these kinds of behind the scenes things like we are. The Astonishing X-Men MOCO is available now at iTunes and on Hulu. As we’ve done previously, we’ve got a preview of the brand new Marvel motion comic Astonishing X-Men: Gifted. Featuring the talents of Joss Whedon and John Cassaday, this project offers fans a cool way to enjoy a great comic story on their favorite portable device like an iPhone or iPod Touch. Even though I’m a fan of reading paper comics and I hope they don’t go away any time soon, this is just another way in which new fans can potentially be brought into the fold. Which is a good thing. Plus, with this kind of story and the talent involved, you have to expect this to be a pretty big success for Marvel. Hopefully, that will mean more comics will be getting the “motion” treatment. So, check out this preview and enjoy it. Also, as we agreed to do in order to bring you cool things like this, following is Marvel’s “official” info about this project and this preview. Marvel is proud to unveil your first look at episode 2 of the Astonishing X-Men Motion Comic! Based on the acclaimed story by superstars Joss Whedon (Buffy The Vampire Slayer) and John Cassaday (Captain America), the X-Men are faced with a mysterious new villain and a possible cure for the mutant gene! Now Cyclops, Wolverine and all your favorite mutants must face the greatest threats of their lives and, before it’s all done, experience one of the most jaw-dropping moments in Marvel history! Like many things in life these days, a music video about a rather famous group of mutants and the comic chronicling their adventures is probably something that’s inevitable. So, its with almost no surprise at all, really, that we bring you this brand new music video about the Astonishing X-Men. To be honest, the video is actually kinda cool but I’m not sure if that means it really is or if it just means I’ve given up. I like to think its the former. Anyway, as with videos of this sort provided by our friends at Marvel, we’ve got to include the following bit to explain the video and satisfy the legal department. So, here you go and enjoy the video after the jump. Marvel is proud to unveil the official Astonishing X-Men music video, “Rise Up”, David Ari Leon, Guy Erez, Bronx Style Bob, Christian Altman and the Marvel Music Group. Featuring previously unseen footage from the hotly anticipated Astonishing X-Men motion comic, based on the acclaimed story by superstars Joss Whedon (Buffy The Vampire Slayer) and John Cassaday (Captain America), “Rise Up” will have you cheering for more! Marvel is also proud to present MarvelFest NYC 2009, an all-new interactive outdoor experience in New York City to celebrate the iTunes release of the groundbreaking Astonishing X-Men Motion Comic on October 28th. Join celebrities and the biggest names in Marvel history to commemorate the Astonishing X-Men premiere, projected three stories high in Union Square at MarvelFest! For complete details and official rules regarding MarvelFest NYC 2009 please visit www.marvel.com/fest. We have a decent load this week, from the conclusion to the exceptional Planetary to quite a number of Marvel books worth your time. Planetary #27 is the conclusion to Warren Ellis and John Cassaday’s brilliant series. Combining pop culture commentary, with a twisted spin that Ellis is known for and the direction of Astonishing X-Men artist John Cassaday. There was a preview in the back of Ex Machina #45, which had me excited for this issue. From Marvel, there is a ton of good stuff. First, we have the premiere of Phil Jimenez on Astonishing X-Men alongside Warren Ellis. Its weird, you know? We have a Planetary/Astonishing X-Men crossover this week and I am looking forward to that ten fold. Now I’m a giant Rick Remender fan, and this premieres his new ongoing series at Marvel, Doctor Voodoo with Billy Tan. If you like this I strongly recommend Rick’s series Fear Agent and The End League from Dark Horse. Following that we have Ultimate Comics Spider-Man #3. The first two issues were spectacular, and David Lafuente was born to draw Spider-Man. This is easily one of the best reads in comics. Finally, we have the return of Ed Brubaker and Sean Phillips Criminal with “The Sinners.” As always, we here at The Flickcast care about what you read, so leave us a comment and let us know what you liked/didn’t like from this week’s comics. For a more complete list of what comes out this week, check out the one at Midtown Comics. My favorite series of the last couple of years is beginning to wind down and I’m getting quite sad about it. This issue picks up where we left off with New York City Mayor Mitchell Hundred discussing the effects of the previous arc and how Village Voice reporter Suzanne Padilla may be on to the White Box. Our Mayor who can talk and control machines created The White Box around his election night. Padilla was convinced that it helped elect Hundred as Mayor. What happened was the White Box went off and implanted itself in Padilla’s brain, in a similar manner that the device that gave Hundred his powers. Ex Machina is essentially The West Wing mixed in with some super heroics and tracks a retired super hero during his first and only term as New York City mayor. With five issues left, Padilla possessed by the White Box, she is slowly picking off members of Hundred’s cabinet. Who knows what she has planned or for that matter Vaughan. The question we have now is what will Vaughan be doing after Ex Machina concludes? He’s left the writer’s room for Lost and his spec script, Roundtable, is a modern day re-imagining of the Arthur legend. To say the least his life as a writer is expanding and if he has any time for comics now post-Ex Machina I’ll be quite pleased.